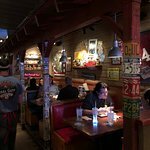 Restaurantes perto de Bubba Gump Shrimp Co.
O que fazer perto de Bubba Gump Shrimp Co.
our popular popcorn shrimp, and weve added pepperoncinis, roasted red peppers, and 3 great dippin sauces. sauteed in a hot and spicy cajun butter sauce. served with garlic bread for dippin. deep fried calamari, red bell peppers and pepperoncinis. served with dippin sauces. 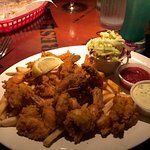 bubbas far out dip and chips, chilly shrimp, spicy chicken strips, hush pups, and mama blues fried shrimp. 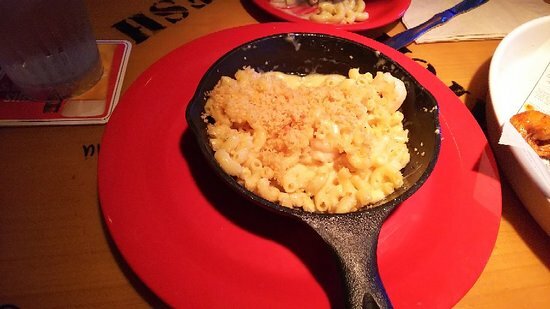 A Greenbow County Favorite, topped with Parmesan Cheese. spinach, roasted red peppers, artichokes and monterey jack cheese with homemade tortilla chips. southern cookin meets the sea! noodles mixed with sauteed shrimp, cheddar, monterey jack and parmesan cheese. topped with golden brown bread crumbs. our best peelneat shrimp steamed in beer. choose from bubbas garlic spice or secret recipe cajun spice. you and your crew will be begging for more, so try 113 pounds! great for 2 people maybe more! delicious icy cold jumbo shrimp with bg cocktail sauce. fresh grated parmesan and croutons. Southern Fried Chicken, Chipotle Ranch, BBQ Sauce, Fresh Greens, Tomatoes, Roasted Corn, Jicama and Monterey Jack Cheese with a heap of Frizzled Onions on top. fresh greens with charbroiled chicken, strawberries, pears, and glazed pecans. we toss it all together with raspberry vinaigrette, and top it with feta cheese. clam chowder or bisque with caesar or house salad. An Alabama twist to a low-country favorite. 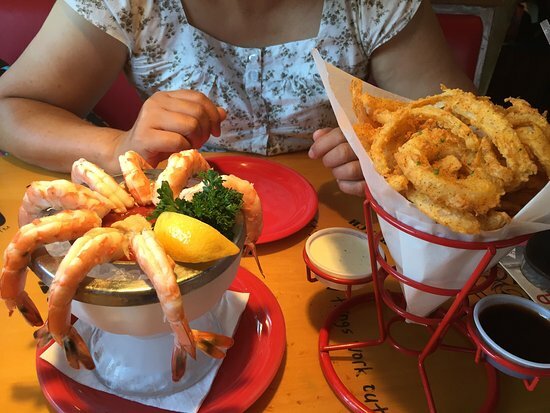 sorry, no shrimp on this classic. jenny would be proud! a great mushroom burger with pepper jack cheese, red onions, avocado, spring mix and remoulade sauce. served with fries. three spicy shrimp tacos, offered either flash fried or grilled, served with mayan salsa, avocado tomatillo salsa, and mexican crema. 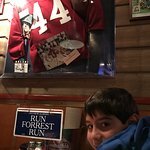 forrest and lt. dan had one everyday! your choice of a southern fried or charbroiled fish sandwich with louisiana special sauce and pepper jack cheese. served with fries. just like the ones in new orleans, french loaf stuffed with warm popcorn shrimp! served with fries. a big sandwich with big flavor, cajun grilled chicken breast, crisp bacon, pepper jack cheese, and guacamole on a toasted bun with fries. Our twist on a classic sandwich! Pan Seared Chicken Breast topped with thin sliced Ham, melted Swiss Cheese, Spring Mix, Tomatoes and Mayo - all on a toasted Baguette. Served with Fries. with hot and crispy fries and cocktail sauce for dippin. large shrimp with crab stuffing, baked in garlic butter, and topped with monterey jack cheese. served with jasmine rice. lots of shrimp cooked in a spicy broth and served with jasmine rice and french bread for dippin. an authentic spicy recipe from our staff in the french quarter. lots of tender shrimp broiled with butter, garlic, and spices, and served with jasmine rice. bubba always loved this one! served with cajun marmalade and fries. large chargrilled shrimp and andouille sausage with mashed potatoes and bourbon sauce. Of Course We Have Scampi! Tender Shrimp sautéed with Capers in Lemon-Garlic Butter, served over a bed of Linguine. love shrimp? this ones for you! hand breaded coconut shrimp, chilly shrimp, fried shrimp, and japanese style tempura shrimp with fries. and of course great dippin sauces like tangy asian, cajun marmalade, and zesty cocktail. large shrimp skewered with red and green bell pepper, red onion and andouille sausage, then brushed with a tangy kentucky bourbon sauce. served with mashed potatoes and corn on the cob. large shrimp, skewered with fresh red bell peppers, red onion, yellow squash and zucchini, chargrilled and served with jasmine rice and a lemon garlic cream sauce. forrests favorite meal after a day on the boat! 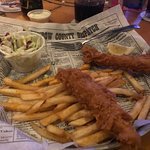 southern fried shrimp, seafood hush pups, fish & chips, coleslaw and dont forget the delicious sauces for dippin tartar, cocktail and remoulade. boneless breast of chicken, fresh golden corn and mashed potatoes with gravy, better than you can imagine. a tender 10 oz. usda certified angus top sirloin served with mashed potatoes, frizzled onions and juicy sliced tomato. slow roasted, served with fries. tender shrimp sauteed with capers in lemon-garlic butter, served over a bed of linguini. Flash fried Shrimp, Fish with Cajun Spices, and steamed Canadian Lobster Claw. Served with Fries. Blackened Chicken, Shrimp and Andouille Sausage, sautéed with Bell Pepper, Onions, and Rice in Bubba’s own Spicy Sauce. Topped with Tomatoes and Green Onions. lt. dan says theyre great with most anything, and lil forrest thinks theyre big enough to share! a delicious mix of steamed mussels, clams, snow crab, lobster claw and shrimp. served with jasmine rice and a side of mamas best garlic bread..
pan seared fish, laid over mashed potatoes with sauteed spinach and lobster butter sauce. one pound of snow crab legs steamed in garlic and herbs and served with drawn butter and jasmine rice. this delicious light dish of grilled salmon and fresh vegetables has a bit of garlic herb butter and capers, served over jasmine rice. broiled mahi mahi over a bed of jasmine rice, topped with grilled shrimp, a lemon butter sauce and roma tomatoes. hand breaded fillets of tilapia in a wine lemon butter sauce with capers, tomatoes, artichoke hearts and finished with pan seared shrimp. mamas warm bread pudding, homemade biscuit topped with fresh strawberries and melt in your mouth chocolate chip cookie sundae. fresh baked chocolate chip cookie served warm with vanilla ice cream, topped with chocolate and caramel sauce, peanuts and whipped cream. No one made it like Mama. Restaurante temático com clima informal, decoração super legal e boas opções de acompanhamento para um bom chopp gelado! 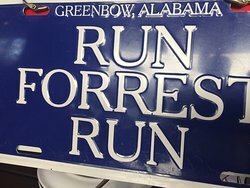 A gente olha para todos os lados e se encanta com os objetos e frases que parecem ter saído de dentro do filme Forest Gump! Eu , minha esposa e meus cunhado fomos induzidos pela propaganda local e acho que a propagnda é melhor que a realidade do local e comida. Ambiente descontraido, comida boa, preço justo e oratos bem servidos. A espera é longa, portanto recomendavel chegar cedo para não esperar tanto. 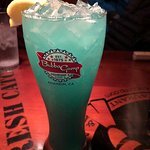 Ótimo restaurante como outros da rede Bubba Gump. Próximo a vários hotéis e da Disneyland é uma excelente opção para jantar. Possui estacionamento próximo e gratuito se você validar o ticket na hora de pagar a conta. Recomendo para quem adora frutos do mar. O restaurante tem uma decoração legal, lojinha e bom atendimento. Os pratos, no geral, são petiscos. Bom restaurante para jovens. A decoração é muito interessante, o cardápio imenso, muitas opções de comida e bebidas. O atendimento foi simpático e atencioso. Excelente custo benefício... Vale a pena uma visita!! 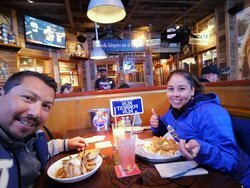 Os funcionários e antigos clientes da empresa respondem rápido a dúvidas sobre Bubba Gump Shrimp Co..